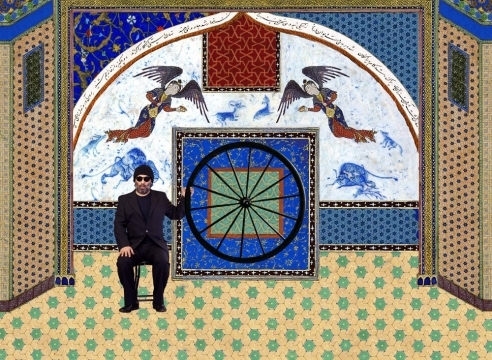 In his most recent video, The King of Black (25 min., 2013), Azari defies the boundaries between two- and three-dimensional media by treating his projection screen as a standalone canvas rife with imagery that references classic Persian and Orientalist painting, accompanied by text and audio components reminiscent of Western silent films. Based on a chapter from the learned Persian poet Nizami Ganjav’s Haft Paykar or “Seven Beauties” (1197), an epic which explores timeless, universal themes involving the impossible quest for perfection and limitations of the ego, The King of Black chronicles Sassanid King Bahram V’s journey for self-knowledge; a Paradise found and lost. 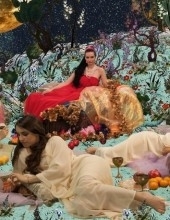 Through staged live action set against tableaus largely formed from digitally reconstructed 16th- century Persian miniature paintings rendered in hyper-saturated hues, Azari conveys the Islamic conception of Heaven as both extraordinary, enchanted, and yet, merely an illusion. Overtly mythical portraits of the Arab world are also prominently featured subjects in Azari’s painting installations on view. Here, classic Orientalist paintings become the fodder for a mischievous, multilayered critique of the traditional Western gaze into Muslim identity and its legacy. In one grouping, two of the genre’s most celebrated paintings: Jean-Léon Gérôme's The Snake Charmer (1870) and Eugène Delacroix’s Fanatics of Tangier (1838) are meticulously replicated, albeit altered by introducing some striking anomalies. Fueled by notions of exoticism, two paintings of the harem – one of the most influential Orientalist tropes championed during the Napoleonic and Victorian ages -- receive an updated, pin-up style makeover. Papering the surrounding gallery walls with imagery composed from random Google searches related to terrorism, Azari concludes that the West’s inability to move beyond their basic assumptions about Islam is perhaps unavoidable in this online age where context often trumps content. An illustrated exhibition catalogue will features essays by Negar Azimi, Senior Editor of Bidoun Magazine, and Alexandra Keller, Associate Professor of Film Studies and Director of Film Studies Program at Smith College. Born in Shiraz, Iran in 1958, Shoja Azari is an artist and filmmaker who has lived in New York since 1983. His work has been exhibited globally, with solo shows throughout Europe and North America. Azari has participated in exhibitions at the Venice Biennale, at museums such as the Haus der Kulturen, Germany and the MUSAC, Spain, and at art fairs including Art Basel, Switzerland, ARCO, Spain, and Art Dubai, UAE. His works are in the permanent collections of various museums and foundations, including the Museum of Contemporary Art (MOCA), USA, and the Farjam Collection, UAE. Since 1997, he has collaborated with Shirin Neshat on film and video installations including Women Without Men, which won the Silver Lion for best director at the 2009 Venice Film Festival. Azari has also collaborated with Shahram Karimi on video paintings, which project video on painted surfaces.